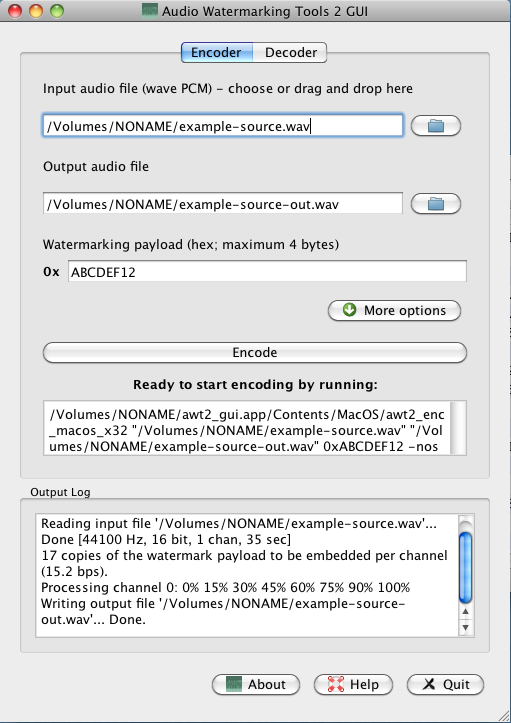 AudioWatermarking.info has released version 1.08.7 of Watermarking Tools 2 (AWT2), a set of shareware utilities for embedding (and retrieving) digital watermarks within audio files. AWT2 watermarks are inaudible and highly robust, surviving low bitrate transcoding with lossy coders, mixing, effect processing, acoustic coupling (transducing via air) and time stretching. Fixed bug in the decoder (could cause crash). AWT2 is now available in a form of SDK (static library + header file + example) for various platforms including Windows, Linux, Mac OS, iOS. AWT2 SDK is available upon request. Reworked and detailed error codes. 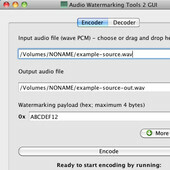 Audio Watermarking Tools 2 for Windows, Mac, and Linux (includes console and GUI utilities) is available to purchase starting at 69 EUR.